Is this the right Halton St Wilfrid? Our striking and beautiful church building, completed in 1939, was designed by Arts and Crafts architect, Albert Randall Wells. It has sculptures by Eric Gill and other artists. It is a grade II listed building. It bridges the gap between the Arts and Crafts style and modernism. It has Early English gothic inspired details, such as the triangular-headed windows. In 1937 it was announced that Sir John Priestman, a Sunderland shipbuilder, had offered £10,000 to build a new church at Halton. Lord Halifax donated the land. The foundation stone was laid on November 6th, 1937 in pouring rain. The new church was consecrated in May 1939. The stone church with its east apse is impressive in structure. It is richly provided with large windows and noted for its bright and spacious interior. Large expanses of clear glass within tall, stepped lancet windows allow light to flood high vaults and cast shadows on the plastered interior. The transepts are joined by a tower with a wooden spire at the crossing, often illuminated at night. One striking feature is the woodwork, the seats are of ash wood and the chancel woodwork is made from Columbian pine, including the choir stalls and pulpit. Wells also furnished much of his interior, notably with lively woodwork, incorporating shuttle and bobbin patterns. A joint Heritage Lottery Fund-English Heritage grant of nearly 500,000 was awarded for renovations to the roof and windows. The work was completed this year. Arthur Randall Wells (1877-1942) had previously worked on notable Arts and Crafts churches, principally with WR Lethaby at All Saints, Brockhampton-by-Ross, Herefordshire (1901-2) and ES Prior at St Andrew’s Roker, in Sunderland (1912). But his church of St Wilfrid, Halton (1937-39) is equally influenced by modernism. The visitor is impressed by tremendous space. Large expanses of clear glass within tall, stepped lancet windows allow light to flood high vaults and cast shadows on the plastered interior. ‘The result is memorable, though disturbing. It is possible to point to its indebtedness to the cubic form used by Lutyens in the 1930s, to German expressionism in the interior, and to a touch of the ubiquitous Scandinavian taste that was so admired’ (Linstrum 1978). Wells also furnished much of his interior, notably with lively woodwork, incorporating shuttle and bobbin patterns. 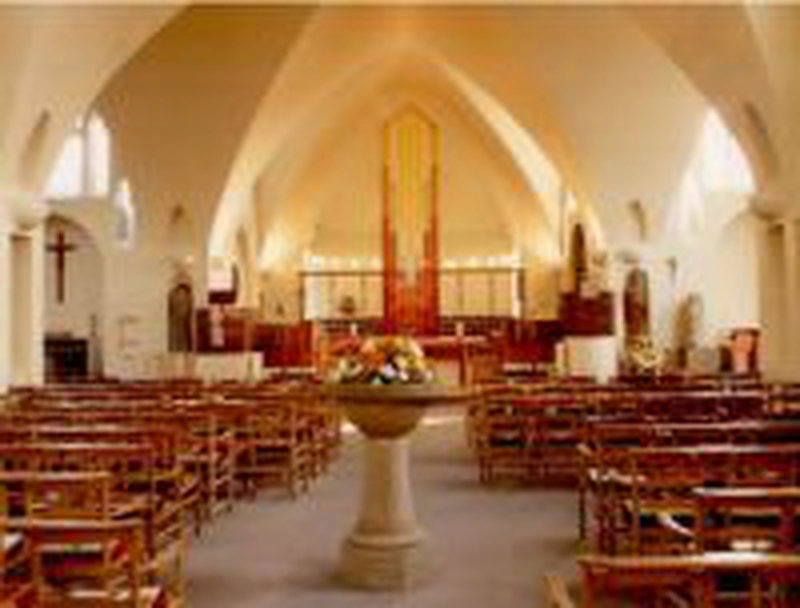 The church interior has been successfully reordered (1981-87, under the architect Peter Hill) but many of Wells’ original fittings have survived. Of note in the building is a statue by Eric Gill of St Wilfrid (ca 1939). Names of Vicars of Halton can be found here.